I found this video of every Kramer entrance, in chronological order, on Spungella, where Jean-Denis has also kindly posted a link to my bouncing ball lecture. Thank you! As a big Seinfeld fan I've gone back and watched many of the earlier episodes in which Kramer's character was not as defined. It's really interesting to see how the actor, Michael Richards, slowly evolved the character, something that's apparent in his entrance - it gradually becomes more defined and consistent although he also does variations on it depending what the scene requires. At the start the characters are also getting more acquainted too - he knocks in the first one! and holds back, asking permission to enter, in the second one he looks a little unsure as he crosses the threshold but then quickly becomes almost overly comfortable crossing the boundary into Jerry's apartment. 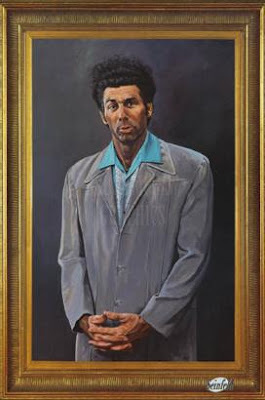 It also follows on from from what I was talking about before - finding gestures and idiosyncrasies that are specific to the character you're animating, Kramer is very unique - he's both laid back and very intense, and his sliding entrance fits him perfectly. I've watched a documentary where Michael Richards talked about this (and if I remember correctly), he said one day he found some shoes in the wardrobe department and tried them on, they were the wrong size but they had smooth sole which enabled him to perform this sliding entrance, he felt that the shoes were one of the defining keys to performing Kramer, someone who slid through life. It's also very comical, Michael Richards is an amazing physical comedian, a quality which perfectly counters Jerry's verbal wit, not many people could get a big laugh from just entering a room. No wonder it became his trademark. I've decided to order my blog so that anyone visiting might find things they're interested in more easily. I've added labels to all the posts, which you can find in the sidebar, and also put every post under 6 main topics. Animation lectures, workshops and animation methods - aimed at anyone new to the industry wishing to learn more about the techniques of the animation process. Animators who have bravely sent me their work asking for my opinion on it. I believe viewing critiques of other people's work is a good way to learn how you might improve your own animation. 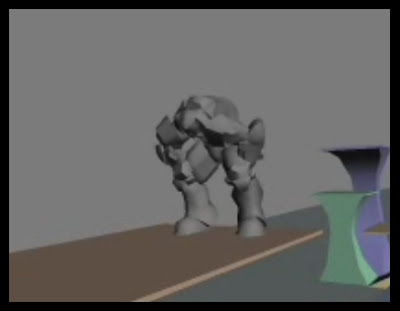 Any posts which may give you an insight into some aspect of working in the industry - how a specific shot was done, early animation tests for films etc. Links to film trailers, other animator's websites, or things of interest. Posts regarding my personal work and employment, as well as website updates and anything else. Theories and thoughts, usually animation or film related. There is also a labels list, so for example, you can sort posts by the title of the film worked on - Hellboy 2, The Dark Knight, The Tale of Despereaux etc. If you'd like to read more posts under any of these topics, please let me know. I recently received an email from animator named Adam king, who showed me his work and asked my opinion on how to improve? It's a tricky question. Adam is not new to animation, he has a lot of experience, has built up a solid grasp of the fundamental rules of animation and displays a real talent for physical action. So once these basics are learned, how do you progress to the next level? It's something I often wonder about myself and one thing I try to do is spend time reading blogs and animation websites, looking for inspiring work and hoping to come across a little gem of information that can help advance my own work. I stumbled across an interview with Brad Bird on the spline doctors site and he said something on this subject which really struck a chord with me, he's talking about what separates good animation from great animation. "We tend to rely on the stock solutions to problems by cobbling together things we've seen [in animation before] there are animated features where I just know every little pattern that they're going to do before they do it ... and it's slick, but it is absolutely not felt, it is series of little clichés and you're not getting any insight into the character ... Observe the things around you, observe the people around you, what kind of character is this, is this an arrogant character, is this a insecure character, how does insecurity manifest in movement?" I know that my own work suffers from this, when I look back at some of my older work I can now see it's riddled with clichés. 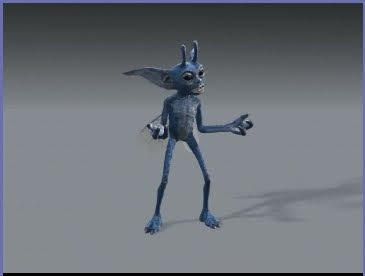 The first CG acting test I did with the Pixie from the second Harry Potter Movie is an example, the animation isn't great but also I can now clearly see that much of the acting was borrowed from other stuff I'd seen - the shaking head, the hand flurry, the twining 'W' arm positions, the blinks, and expression changes - Some of it intentionally so, some of it not. The trouble is it's sometimes fun to animate clichés, after all we're fans of animation, that's why we got into it, and so when we start out we want to copy the things we've seen done in the medium. Also we know these ideas will work, so when staring at a blank screen it's very tempting to do something we've seen before rather than to try and come up with something new. I also think it's subconscious, the brain has stored in it your favourite bits of animation and calls them up without your knowing. Eamon Butler, my animation supervisor at Double Negative once said to me "never go with your first idea". When I'm first given a shot, often after hearing the soundtrack and seeing the pre-vis or storyboards, an initial idea will pop into my head. It would be easy to just do that, but I believe this is more likely to be an obvious clichéd idea or a copy of a similar animation I've seen - I have no factual basis for this theory by the way, it's pure speculation. 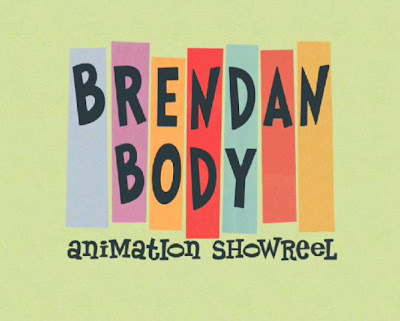 But I think Eamonn was on to something, and I think it's good to never start to animate a shot without first exploring the possibilities of it, as this will lead to a better and more original work. Adam sent me some of his work, and I'd like to talk about an exercise he created, shown above, which has a character running through a scene. 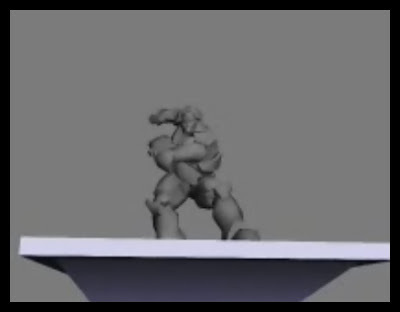 The piece is well executed and for most part I really like the physics and posing of the character. I especially appreciate that there is an attempt to create a thought process in the character too, even though it's predominantly a physical exercise and the character's face is rigid. The way he looks around after jumping down is a nice touch and really adds something to it. However, there are a few points where I think he has perhaps strayed into an obvious pose or gesture. 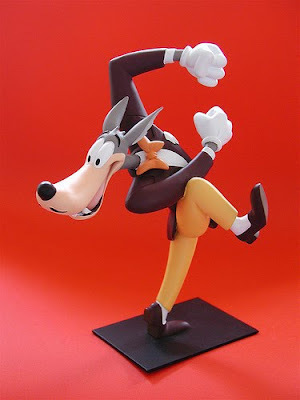 An example is in the anticipation before the jump down, the pose he's used, where he leans back, twists his body, and swings his arms to the side works perfectly well but feels like an animation standard, almost like a toned down cartoon anticipation - like Sylvester would do before he chases after Tweety or Tom after Jerry. Adam has the principles learned, he knows before the jump there should be an anticipation and the one there works, but for me it needs something extra to really sell who the character is and what his motivation is. The first part of the second shot is essentially an anticipation for the jump off the building, it would've been easy to make it clichéd and uninteresting but he has added ideas into this action which have really lifted it. "Ultimately I tried to sell the idea of him getting ready as a tennis player where they are ready to start playing and their ankles are going up and down. 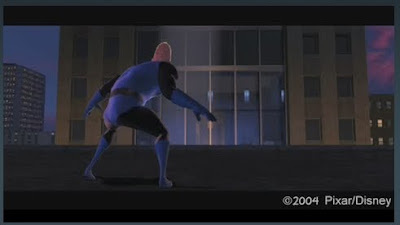 I was trying to sell Mr.Incredible not only as a big guy, but a big guy that could be very fast and agile. In terms of the motivation, I kept thinking Mr. Incredible kept telling himself "Think fast, think fast!!"." This is brilliant, Carlos has not only given Mr Incredible a subtext ("think fast, think fast") which I talked about in a previous post, but also added an idea as to how the action is going to be performed - like a professional athlete, a tennis player. I think it's really successful, I actually remember seeing that shot for the first time in the cinema and being amazed by it then. Obviously, I wouldn't suggest you copy this idea, instead try to do something for your character, something specific to him. The character's panting at the end of the scene, again conveys the message that he's tired and I like that this has been added, but seems a bit artificial, almost mechanical. It might have been better to show his exhaustion by adding another idea to it, a small stumble as he stood up, or maybe combine the pant with looking at where he has just been or where he's going next. 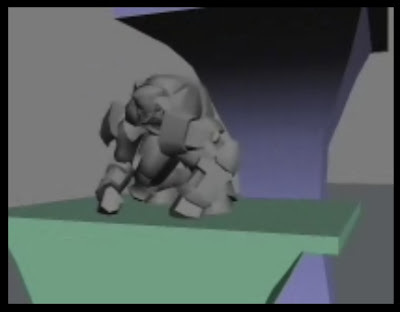 Adding something to this basic idea would make it unique and original, I believe that once the principles have been learned, originality is one of the keys to improving and attaining that illusive next level in animation. 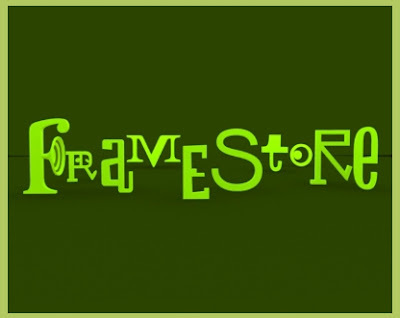 Back in July last year I won an internal competition to find an idea for a new Framestore ident. I put the movies of my various concepts on youtube but was never happy with the video quality. I have now switched them over to vimeo which is much better. I used the rainy weather over the long weekend here in Sydney as an excuse to finally update my Showreel. It now includes my latest work from The Tale of Despereaux and Hellboy II - The Golden Army. The page also gives you a sneak peek at the look of my new website which I'll be unveiling soon.